A mining company in Venezuela was experiencing localized wall loss on the inner diameter (ID) of their furnace tubing in the Reducing Gas Furnace. Attempts to use A-Scan Ultrasonics proved inconclusive as insufficient back wall signatures were observed. 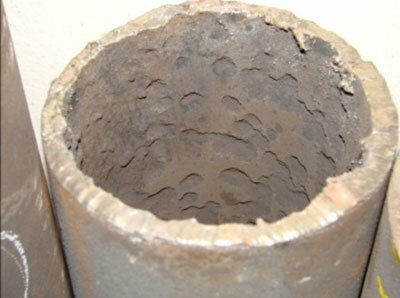 The company had been replacing furnace tubing at scheduled periods to avoid in-service failures while continuing the search for a method of identifying sections of tube that exhibited ID corrosion/thinning. The tubing material was rare and expensive (ASTM-A297 Modified Nb). 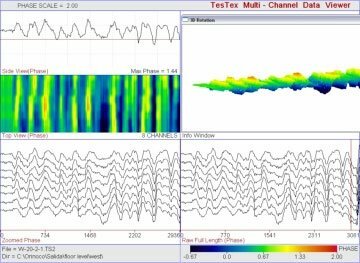 TesTex, Inc. was contacted in an effort to find a technology that could address this need. Several tube samples were cut, photographed, and shipped to TesTex, Inc. The idea for the original inspection was to cover 100% of the furnace tubes, however due to the high number of indications found the productivity was slowed and a 100% inspection was not possible in the time available. Approximately 736 linear feet of tube was inspected per day covering 2 scans per tube on the inlet and outlet sections of the furnace. Tube specifications are as follows: Inlet 8″ OD X 0.460″ NWT (203mm OD X 11.7mm NWT) and 10″ OD X 0.460″ NWT (254mm OD X 11.7mm NWT) ASTM-A297 Modified Nb. Outlet, 6″ OD X 0.460″ NWT (152mm OD X 11.7mm NWT), ASTM-A297 Modified Nb. The most practical method with which to conduct the inspection was to use the TesTex, Inc. developed PS-2000 Pipe Scanning System along with the principles of Low Frequency Electromagnetic Technique (LFET). Three different sized scanners [6″ (152mm), 8″ (203mm), and 10″ (254mm)] were used to achieve the greatest sensitivity when inspecting the different sized tubes. The TesTex developed LFET Scanners are able to inspect a 4” wide swath with one quick pass of the scanner. The use of this system requires that the OD tube surface is consistent and a high-pressure water blast is usually quite sufficient in regards to surface preparation. TesTex, Inc. was able to inspect 180° of 44 tubes on 3 levels in both the inlet and outlet sections of the furnace. To obtain the data, 2 scans were taken per tube per level, creating 90° of coverage per scan, with the scans taking place on opposite sides of the tubes (East and West). TesTex, Inc. worked for 3 days and was able to complete the inspection of approximately 1400 linear feet of tubing. Over 80 indications were discovered and marked during the inspection. 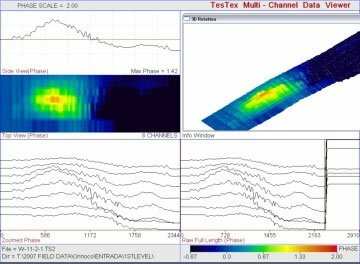 A-Scan Ultrasonics is the normal method used in verifying the indications; however neither TesTex, Inc. nor a third party company were able to obtain any ultrasonic thickness measurements due to the lack of any back wall echoes. 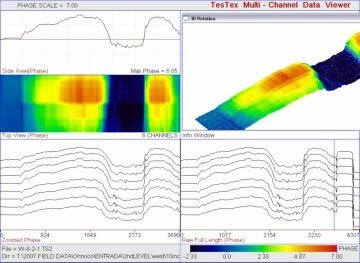 Extensive surface preparation was completed by TesTex prior to the attempted A-Scan measurements to no avail. TesTex suspected that the uneven ID of the tubes was the cause of the lack of back wall signatures. To prove the accuracy of the findings several sections of the tubes were cut and the pitting/localized wall loss on the ID identified. During the operation of the furnace the mining company had noticed discolorations on certain tubes. These areas were inspected using the LFET system and indications were found and noted as heat affected areas. After the inspection was completed, the mining company cut and removed several samples from the inspected areas. The removed samples showed the same pitting on the tube ID as the samples sent to TesTex, Inc. before the inspection began thus proving the findings of the inspection. Two other furnaces at the mining company also have the same problem. With the experienced gained from this inspection, it is foreseeable to believe that future inspections will be much faster and cover more area. TesTex, Inc. provided the mining company with a fast and cost effective method to inspect their furnace tubing for pitting and corrosion allowing the company to shorten their scheduled outages while saving money.